Remember the Victory Gardens of WWII? It seems we’ve been harkening back to the wisdom of these simpler times recently. Once again, environmental, health and food safety concerns are seeing people of all walks of life return to kitchen gardens. Even the Queen and First Lady are participating. 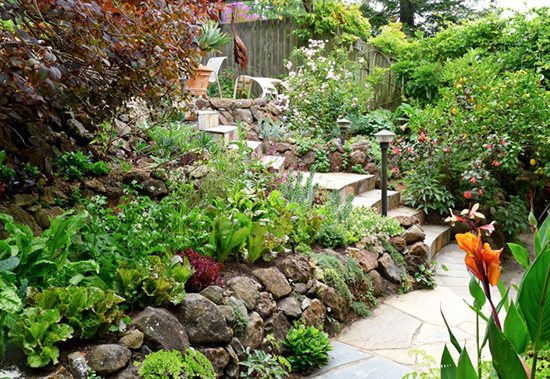 Working with landscapers on a regular basis, I wondered if any were giving some serious attention to the trend by working edibles into their residential and commercial designs. What a great opportunity to inject an innovative specialty into the regular roster of landscaping services! 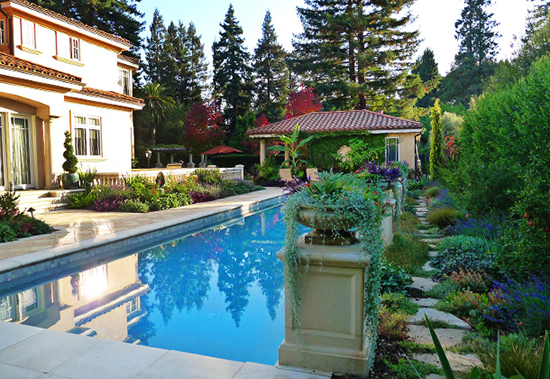 Not everyone has the space for a dedicated garden area in their yard, but may be interested in optimizing the use of their space. After a quick perusal online, I found some beautiful examples. An interesting commercial example. 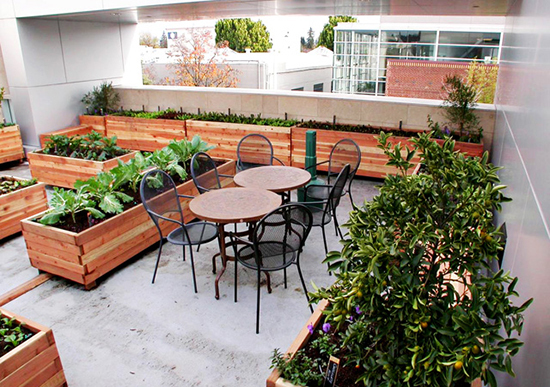 This modern rooftop public space features edibles in planters surrounding a lunch area. After all, gardens don’t have to be enjoyed only at home. Why not provide a natural surrounding — and a fresh addition to lunch — available for all? 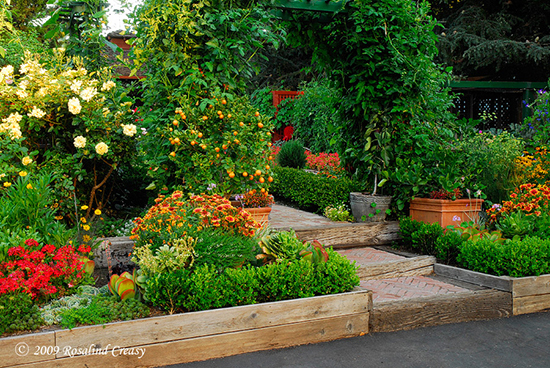 This beautiful walkway is bursting with both floral and vegetable components. The designer was inspired by her own grandmother who loves to use ornamentals and edibles together in fusion for her garden. 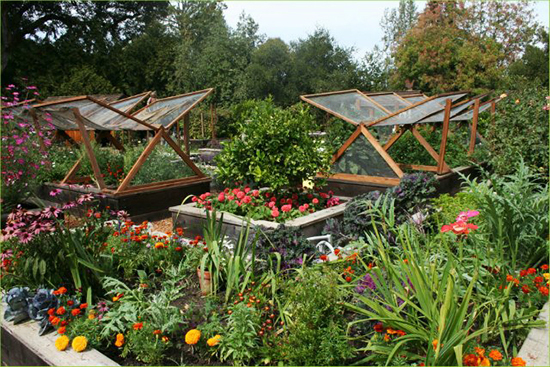 This garden features some screened in planters which can open as needed. Perfect for a Southern Ontario climate where any extension to the growing season would always be welcome. Neat idea! Another landscape by Star Apple, I like how a variety of plants are worked together, especially with the stonework and bed rocks. Create herb gardens close to the kitchen door. Plant colourful peppers such as Lipstick or Habanero alongside flowers. Tuck lettuce, radishes or other short-lived greens into a flowerbed. Try attractive yellow or rainbow chard. I myself am an enthusiastic (though novice) gardener, but from my own brief research, it seems there is a nice niche open here (naturally I’ve created a Pinterest board). And from a marketing perspective, quite fresh! It’s just a great example of people doing things a little differently. And differentiating themselves from the pack in the process. From floral/vegetable design and installation to on-site vegetable gardening workshops, it seems there is no limit where this can be taken!